What is the relation between African masks and facilitation? 'One day a freelance consultant sat behind the computer......' This was one of the starting sentences in writing a creative story on how to use social media as a tool for learning. With the assistance of a creative writing facilitator from Loesje,Faciliteeronline.nl (Joitske Hulsebosch, Sibrenne Wagenaar and Simon Koolwijk) organised a co-creation workshop in developing slogans for the training course 'Social Media for facilitating learning processes in organisations'. The purpose of the workshop was to identify the most important issues for this training course by going through a creative writing process. Creative writing exercises Based on the starting sentence 'one day.....' each participant continued the story by adding a new sentence, following the previous sentence. Each round the Loesje facilitator added a word, which was integrated in each sentence. The stories which were produced visualised some hilarious stories, creating fun and laughter. Last week the Magazine 'E-Organisations and People' published an article about the 'Art of online facilitation: sustaining the process' in their edition Vol 18, No 3, August 2011. This article I wrote with support from Jet Proost, Bob MacKenzie and Rosemary Cairns. In the process of writing this article I compared two successful and one unsuccessful case about virtual exchange in my 5 years experience as an online facilitator. Out of this process of comparing, I concluded that 'twelve factors' are needed for having a successful online exchange. I argue that the presence of an online facilitator is essential to get most out of the group and to keep the process going. Online facilitation requires a different approach from face-to-face facilitation in activating groups. Twitter! A great tool for networking and expanding your knowledge base! Recently I have been reading the publication #Twitter works! - author Fiona Stoop (@werkcoach). 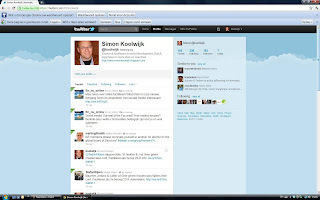 In this Dutch written publication Fiona Stoop shares some hintful tips on how to use Twitter successfully for your work.